Engaging Singapore Seniors In Proper Fitness Programs. Like many developed countries in the world, Singapore has a rapidly aging population, where seniors and older adults above the age of 55 are fast becoming the statistical norm in this small asian country. Thankfully, via governmental health education programs, more and more senior citizens are now paying attention to their health and fitness as compared to a decade ago, and many are still able to play active and important roles in the various communities they serve today. However, more could definitely be done to help increase the number of our older adults engaged in physical activities, especially in structured and age-specific Senior Fitness Programs. Over the years, physicians have constantly affirmed the fact that seniors and older adults SHOULD and COULD engage in regular, progressive exercise. And scientific research has also consistently validated the far-reaching health and psychological benefits of a physically active lifestyle. From combating numerous age-related medical conditions like: arthritis, osteoporosis, heart disease, high blood pressure and diabetes, a Structured Exercise Program for Seniors can also help reverse the loss of one’s muscle and bone mass, and even help to alleviate clinical depression – a silent and often under-rated condition that afflicts many senior citizens. More importantly, engagement in an exercise/wellness program can also give our seniors a sense of control over their lives and destinies, and help to perpetuate an overall sense of well-being and self-sufficiency . 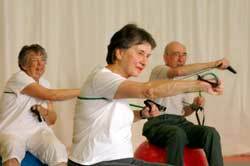 However, before embarking on any fitness program, seniors are well-advised to check-in with their health-care providers for a Full-Body Check-Up; and are also best advised to exercise in a structured and supervised environment to pre-empt any risks of age-related complications from arising from a “Do-It-Yourself ” scenario. With sound, proper guidance such as those from specially certified fitness experts like the Senior Fitness/Older Adults Specialists, there’s no reason why our Singapore seniors cannot enjoy satisfying and fulfilling lives in their golden years like their counterparts in the developed West.